Despite being entrenched in the most important training camp of his career, the Chael Sonnen comedy tour made a quick cameo on this week’s edition of ESPN’s MMA Live. Sonnen will challenge middleweight champion Anderson Silva for this belt at UFC 117 on August 7th. Although the outspoken underdog has done more than his fair share to sell the pay-per-view broadcast, the part-time realtor managed to plant himself in front of another microphone. 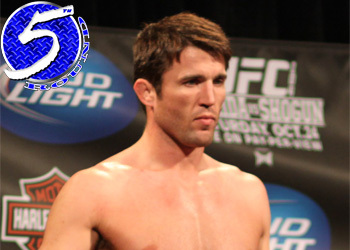 Without a doubt, Sonnen has emerged as the sport’s most intelligent smack talker. In fact, his latest verbal assault had the show’s hosts giggling hysterically in the background. It is now “The Spider’s” responsibility to verify if Sonnen’s his mouth has written checks his body won’t be able to cash. Speaking of money, the planet’s baddest middleweight will be entering the Oracle Arena in Oakland, CA a significant 4.5-to-1 favorite to retain his strap.